122 loyalty points Your cart will total 122 points that can be converted into a voucher of 4,88 PLN. Extensor ISOLATE 97% - one of the best high protein in its class available on the market today. It contains 100 percent. whey protein isolate, having a protein concentration 97 percent. This makes it the leader in terms of protein content, yet economical! ISOLATE 97 is produced from pasteurized whey in the process of selective ion exchange. This unique technology allows the separation of fundamental importance in terms of nutritional functional proteins, found in whey - betalaktoglobuliny and alfalaktoglobuliny. Also allowed for the complete elimination of lactose - milk sugar - which is the cause of all the stomach problems associated with the consumption of dairy products. Thus the resulting product has the highest possible to obtain a bioavailability - BV 159 - which provides a very powerful anabolic properties. ISOLATE 97 replenishes protein arising from the increased demand (professional sports, bodybuilding), as well as low-calorie diet (diet reduction) or convalescence. It strengthens the body's immunity and promotes regeneration. 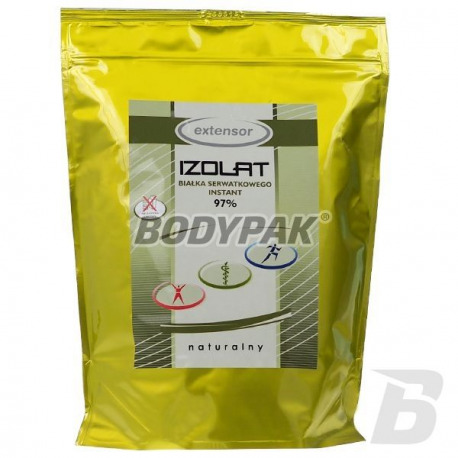 Extensor ISOLATE 97 due to its high biological value allows you to build much more muscle tissue than with other high and some of the amino acid products. Supplementation with this preparation in combination with intense weight training for maximum gains in high quality muscle and strength.